Most Call of Duty players are willing to dish out $16 for DLC. Say what you will about DLC, but at least for the Call of Duty franchise, the system works. Activision has calculated that Call of Duty: Black Ops players spend, on average, $16 above and beyond the retail cost of the game. Statistically speaking, this means that every single Black Ops player has bought a map pack and then some. Of course, the reality of the situation is a little more complex, since many players buy multiple map packs and many buy none. However, given that the game retails for $60 and each map pack retails for $15, either a vast majority of Black Ops players are buying some DLC, or a small minority is buying a great deal of it. Either way, Activision's post-launch content strategy has proven effective. User interest in DLC has actually increased over the course of the last three Call of Duty games. 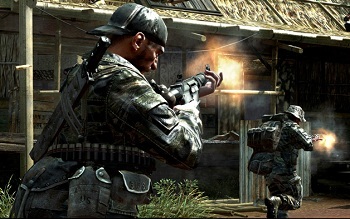 The average World at War player spent $72 whereas the average Modern Warfare 2 player spent $74. An increase of $4 may not sound like much, but with tens of millions of players, incremental purchases can add up fast. Erich Hirshberg, CEO of Activision Publishing, finds this data particularly encouraging for Activison's upcoming Call of Duty: Elite service. Activision has yet to announce pricing, but Hirshberg suggests that it will be a "no-brainer" for series fans.